The story I expected to end a few days ago continues with political figures weighing in on Chick-fil-A‘s inherent (im)morality. Our own Chicago mayor has voiced his opposition to the restaurant’s desire to open more franchises within the city limits. My original post questioned the tendency for individuals to identify themselves with certain brands and how this can create an identity crisis when that brand’s values conflict with our own. That question probably sounds quaint amidst the hype generated by so many public figures tearing this story apart. Speaking of hype, WordPress was kind enough to include my Chick-fil-A post on their Freshly Pressed page which resulted in far more traffic and comments than my little blog is accustomed to. Many of the comments reminded me of the challenges of having nuanced and gracious conversations about culturally sensitive topics. Many of the comments took one step away from the original topic and focused on the effectiveness of boycotts; others took two steps to debate the nature of homosexuality. I’m sympathetic to these somewhat off-topic comments but was especially grateful to those who chose to engage with the actual content of the post. To those who found my blog through Freshly Pressed: Welcome! I hope you’ll stick around and join the conversation. I expect a range of perspectives to be expressed in the comments and simply ask that your perspective be voiced charitably. Even better, ask thoughtful questions of those whose opinion who seem to disagree. There seems to be few places these days for such interactions; perhaps we can reclaim some of that space on this blog. 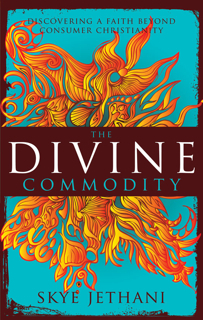 Finally, to those who were interested in the questions raised in my last post I’d recommend my friend Skye Jethani’s book, The Divine Commodity: Discovering a Faith Beyond Consumer Christianity. His is the best treatment I’m aware of of the conflation of corporate and personal identities. Back in 2009 I reviewed and recommended the book and recommend it to you again today. Previous Post Boycotting Chick-fil-A. Or not. As a new reader, thanks for offering a different perspective on the Chick-fil-A situation (for lack of a better word!). And even more thanks for the book recommendation! I’m adding it to my “to-read” list! Thanks Elizabeth. Be sure to check back tomorrow when I’ll post an excerpt from Skye’s book on the topic of branding. “Will hamburgers ever become a passion of Chickfila? May it never be! (Bible joke). Of course they won’t. Why? Their identity is chicken. Good (heavenly) chicken. My question is what do u think concerning this comparison knowing that u talked about consumerism and how corporate want to take our identities from jesus!